Well, I’ve been busy with many tasks recently and hearing the ‘War Drums’ beating around the world. As a matter of fact, Stewart Best and I, just recorded an Emergency Global Report 10-23-2011 and posted for free listen or download on Stewart Best’s website http://www.thelightgate.com and someone who listened to it Sunday, emailed that IT scared the HELL out of them….! I have had an incredibly difficult time posting on Yahoo Groups lately, as I write the message and then send and it completely vanishes, never posted. I may have to do this 3 or 4 times to make 1 post. My time is eaten alive by this and I’m only able to post about 1/2 of what I need to. But we’ll see how this goes just a little longer…??? And if only a little longer is all we,ve got, then OK! Barry Roffman has completed a new Torah Code Matrix entitled IRAN WAR PLAN and posted on his website as “Iran War Plan” http://www.arkcode.com , so if you wish go to Barry’s website or click onto http://www.arkcode.com/custom3_171.html to read the Iran War Plan Code Matrix. Thanks, Barry! Reading Steve Alten’s new novel out entitled: PHOBOS Mayan Fear…! Steve Alten says “Phobos: Mayan Fear reveals a very real threat, not just to humanity, but to our very planet.” ~ THE CLOCK IS TICKING…! This book is somewhat difficult to read, as it’s story weaves in & out of space time and other dimensions. BUT real data reports on CERN are embedded in this novel….! Available from Amazon http://www.amazon.com …. 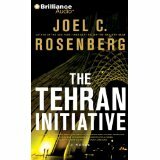 Also at the same time, in another dimension, I’m reading Joel C. Rosenberg’s new novel, just out days ago, entitled: THE TEHRAN INITIATIVE and it is ‘hair-raising’ on the back of your neck ~ reading this stuff about USA, Middle East, Iran, Israel, etc. 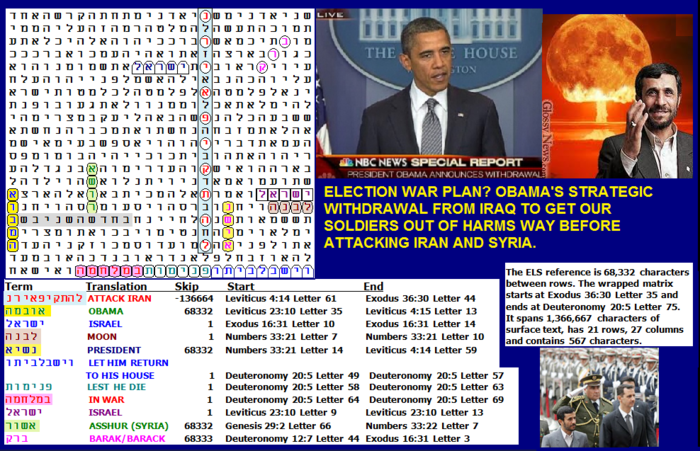 just as it is BREAKING NEWS in real time….AND ~ What if this worst-case scenario comes true…? You can check this book out at Amazon http://www.amazon.com and also visit Joel’s web page at http://www.joelrosenberg.com What a read……!!!!!!! DREAM/VISIONS ~ 5Doves has posted on their website http://www.fivedoves.com a post by H entitled: “Sara Hoffman’s Vision About Libya” which also includes a LINK to a vision by Stan Deyo in 1996. http://www.fivedoves.com/letters/oct2011/henry1024.html so go check it out………. Jerry Golden has posted a new message from Jerusalem, entitled: “May God Help Us All” and in paragraph 6 of message, Jerry reports “3 Great Mysteries”…! The LINK to this writing by Jerry Golden for October 22, 2011 is at his website or at the available link here http://www.thegoldenreport.com/reports/360-may-god-help-us-all and Jerry’s website is at http://www.thegoldenreport.com ……………..
Well, have to go for now, much to do and much more NEWS to read and research for today, Monday, October 24, 2011…………. Thanks Larry. Do not get discouraged. We are all under great pressures and maybe that is why we seem so stupid and dazed at times and lacking in response. All are struggling so much to accomplish the work The Lord has given them while knowing so little time remains that, as Jesus said, is still “daylight”. So grateful for all and anything you do but mostly for what you are and that stands by itself as so,so much. Courage to the end ! Thank you for the Blog. This one is good. Thanks for takeing the time to do this.. Thanks Larry, Keep up the great work and keep fighting the good fight we wont have to wait much longer ! God Bless In Jesus Christ Name !